A librarian works quietly in an office people can only dream of. 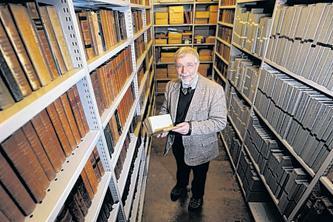 His daily work includes examining and looking after a steadily increasing collection of thousands of books and manuscripts, housed in rooms off a narrow spiral staircase. The works in Lincoln Cathedral Library, opposite the West Front of the cathedral, date back to the 10th century and cover varying issues from church history, make-up tips for ladies and the history of chocolate. Prized possessions include a first edition of John Milton’s Paradise Lost. Across the city, at the Lincolnshire Archives, off St Rumbolds Street, a quiet storeroom with 10ft-high shelves is stacked with hundreds of boxes containing an estimated four to five million items. Church documents, letters, maps, court records and council minutes are some of the things waiting to be catalogued, while people have access to many other works in the public reading area. These two quaint buildings, although not secrets, contain histories undiscovered by many in the county. Librarian Dr Nicholas Bennett said the collection was stored in eight rooms in Lincoln Cathedral’s Medieval and Wren libraries, with 10,000 items dating pre-1800 and 10,000 items dating post-1800s.